Over the last century considerable resources were devoted to research into paint and camouflage for ships, especially during the two World Wars. Camouflage itself is a surprisingly new term, only entering the English language in the last 100 years. Painting and repainting of ships has always been a daily part of ship’s husbandry. 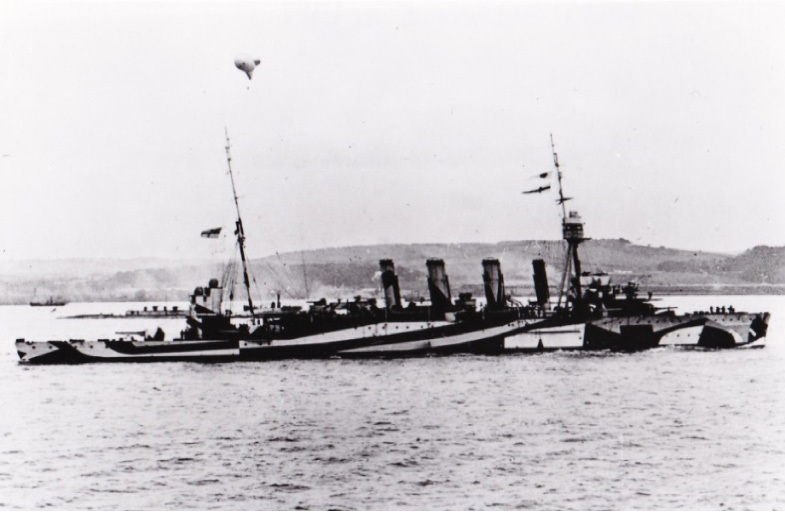 Paint schemes for ships have been many and varied, but it was the outbreak of World War I (WWI) which gave the issue greater weight with the British Admiralty. Painting of ships was no longer about looking good: the increasing lethality of modern weapons meant that concealing or confusing an enemy was more important than a ship’s appearance. One of the most recognisable outcomes of this interest was the use of dazzle camouflage on ships, HMAS Melbourne (I) being the only RAN ship to be painted so during WWI. Although the effectiveness of dazzle style camouflage was questioned, it continued to be used on merchant vessels as it increased crew confidence and morale crews. It is worth noting that recent research into the topic has found that dazzle patterns do, in fact, affect speed perception, and that the principles on which the painting was done were sound. HMAS Melbourne (I) in dazzle pattern camouflage. Interest in naval camouflage post-WWI increased in the decade before the outbreak of World War II (WWII). The Admiral commanding the Australian Squadron in Sydney submitted a report for consideration to the Australian Naval Board concerning painting ships in wartime based on a 1932 trial conducted in the Mediterranean, with orders that ships be painted in accordance with the testing at the outbreak of a war. One of the first major projects was the publication in 1941 of Professor William Dakin’s book The Art of Camouflage, and a classified second edition a year later. There are several pages on marine and ship camouflage, one of the first attempts at centrally collecting and disseminating ship camouflage knowledge. Before this point much of ship camouflage painting was done on an ad-hoc basis, without scientific experimentation and devised by officers and crew aboard the ships themselves. 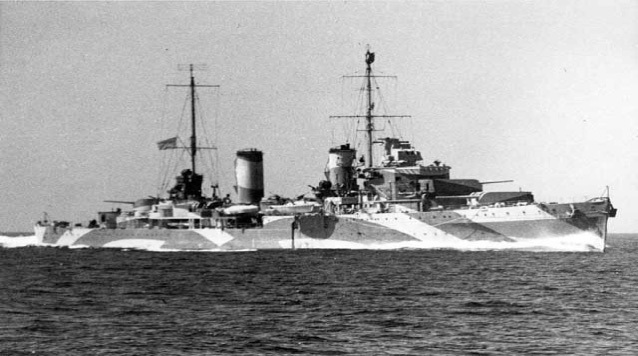 A classic example is the camouflage paint scheme applied to HMAS Perth in the Mediterranean in 1940, whose distinctive design resembled the arches of the Sydney Harbour Bridge. HMAS Perth ‘Sydney Harbour Bridge’ scheme, late 1940. Navies of the world have for a long time been accepting of outlandish paint schemes if they could give them an advantage. Captain Louis Mountbatten as commander of the Royal Navy’s 5th Destroyer Flotilla made unofficial experiments painting his ships in a pinkish-grey colour. The colour, known as Mountbatten Pink, was thought to make ships less visible during sunrise and sunset, the most likely time of attack by U-boats. It was discontinued through lack of effectiveness but its trial does highlight a creativity and willingness to try different colour schemes. Though the experiments and basis of camouflage painting were basic, they nevertheless demonstrated forward thinking on behalf of the Admiralty. The Director of Naval Stores was asking for details of paint availability in a letter dated 4 September 1939 – mere days after the outbreak of war in Europe. Before the official camouflage group was stood up, Professor Dakin was conducting his own experiments on ship painting in 1940 and 1941, using his own yacht and the training ship HMAS Kybra. These experiments particularly interested Rear Admiral Sir John Crace, Commander of the Australian Squadron. Admiral Crace actively sought the advice and aid of the camouflage directorate, asking Dakin to prepare paint schemes for HMA Ships Adelaide and Australia, which he did in May 1942. Camouflage is a discipline that brings together both science and art; the research requiring scientific knowledge and experimentation, with artistic flair needed in execution.This can be seen through the assignment of Professor Dakin as the Technical Director, and the choices made for the Deputy Directors of Camouflage in each state, amongst whom were included architects, town planners and two directors of art galleries. Dakin was scathing of those who could not see the importance of science as it applied to warfare through camouflage research, a post-script in one of his letters on camouflage research saying: ‘One of the examples quoted above provides an indication of how completely the position of Science (which Germany and Japan are using to the utmost) is still completely misunderstood in Australia.’ Painting of ships was no longer about looking good: it was about warfighting effectiveness. US General Douglas McArthur, Supreme Allied Commander in the Pacific, directed all naval, air and land forces to regard camouflage as an instrument of war, and directly referred to Dakin’s Defence Central Camouflage Committee as a key source of technical camouflage advice and direction. Even when camouflage patterns had been (relatively) standardised during the war, orders were still in place which ensured ships could change their schemes ‘to meet changing conditions or special tactical situations’, clear recognition that ships operated in a unique and ever-changing environment.Camouflage research papers and Admiralty orders such as CAFO 1112/42 all made distinctions between the different operating environments and which paint schemes were most effective. Painting of ships since then has been a dynamic activity, changing as new data has provided better solutions and as ships range far and wide across different environments. Tests and observations were conducted throughout the war to ensure that paint schemes were as effective as possible. In 1941 Perth was painted in two different camouflage paint schemes on the port and starboard sides, maximising the opportunity to test out different camouflage principles. The case of the Fairmile motor launches demonstrates the effort put into the camouflaging of RAN ships during WWII. From their inception, tests were undertaken to determine the best camouflage paint scheme so that they might be painted before even being launched. Testing was conducted throughout the war to ensure that the best possible information was available in order that they were painted in the most effective way. The effectiveness of camouflage and painting is the key point of all of this research. A report from mid-1941 relays how a RAAF officer, very experienced in coastal surveillance from the air, was warned that his flight would overfly Australia, and when he did was still unable to recognise her. He reported back that the camouflage made Australia appear to be a small two-funnelled cruiser rather than a heavy three-funnelled one. However, a report from eleven months later notes that the camouflage pattern Australia sported seemed to assist an observer in estimating inclination, a demonstration that camouflage could not do all things all at once; it needed to be tailored for a specific role. The US Navy littoral combat ship USS Freedom was recently painted in a WWII camouflage scheme, demonstrating not only continued interest in camouflage, but interest in older camouflage schemes. These cases demonstrate that the principles behind camouflaging of ships were sound, and that camouflage patterns on ships could be effective, provided that there was a clear objective in mind; camouflage could help conceal or confuse, but it could not do both at the same time. USS Freedom, painted early 2013 in ‘Measure 32’ camouflage pattern (United States Naval Institute). RAN ships have been painted ‘Storm Grey’ for 60 years, albeit other colours were tested on the Fremantle class patrol boats in the late 1990s. In late 2013 it was announced that the surface fleet would progressively move to a ‘Haze Gray’ paint scheme, implemented during scheduled maintenance periods. This new polysiloxane paint has improved durability and fire resistance qualities over the older polyurethane paints. Moreover, near infrared reflecting pigments means that the new grey paint scheme has tactical utility. Ship painting schemes have been ever evolving since WWI, changing to match conditions and as better information becomes available through scientific testing. A ship’s paint job is not only a source of immense pride to the ship’s company, but also a means of concealment which can aid a warship in evading visual detection or recognition. ↑ Nicholas Rankin, A Genius for Deception: How Cunning Helped the British Win Two World Wars, Oxford University Press, Oxford, 2009, pp. 24-27. ↑ The Camouflage of Ships at Sea.C.B. 3098R, published by the Admiralty, October 1945, p. 8. ↑ NE Scott-Samuel, R Baddeley, CE Palmer, IC Cuthill, ‘Dazzle Camouflage Affects Speed Perception’, PLoS ONE, 6(6), 2011: e20233. doi:10.1371/journal.pone.0020233. ↑ Painting of Surface Ships in Time of War, NAA MP1049/5/0 2026/2/378. ↑ WJ Dakin, The Art of Camouflage, published for the Department of Defence by Australian Medical Publishing Company Limited, Sydney (2nded), 1942. ↑ ADM 212/130. A 3045, Camouflage Colours in H.M. Australian Ships (Prof Dakin) 1943. ↑ Guy Hartcup, Camouflage: a history of concealment and deception in war, David & Charles, Devon, 1979, p. 120. ↑ Painting of Surface Ships in Time of War, NAA MP1049/5/0 2026/2/250; ADM 212/130. A 3045, Camouflage Colours in H.M. Australian Ships (Prof Dakin) 1943; NAA MP1049/5 2026/2/873. ↑ DP Mellor, The Role of Science and Industry, Australian War Memorial, Canberra, 1958, p. 535. ↑ Letter to the Minister for Home Security dated 21 September 1942. NAA A453 1942/21/2632. ↑ A Elias, Camouflage Australia. Art, Nature, Science and War. Sydney University Press, Sydney, 2011, p. 93. ↑ Pacific Fleet Confidential Order dated 1 January 1945, NAA MP1049/5/0 2026/2/873, Confidential Admiralty Fleet Orders. ↑ Home Security. Report on camouflage of HMAS “Perth” (with some general observations on HMAS “Canberra”) 25 November 1941; NAA A5954/69. Item 673673. ↑ NAA MP1049/5/0, 2026/2/543; NAA MP1049/5/0, 2026/2/873. ↑ Letter dated 26 April 1942. NAA MP1049/5/0, 2026/2/456. 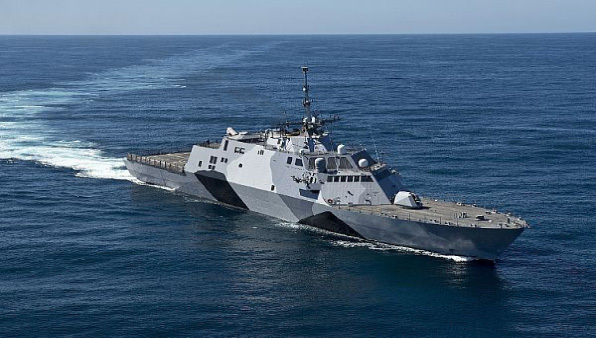 ↑ Sam LaGrone, ‘LCS CO: Freedom is ‘A Mean Looking Ship’. United States Naval Institute, 1 March 2013. http://news.usni.org/2013/03/01/lcs-co-freedom-is-a-mean-looking-ship.